In 1996, W. Dan Hausel discovered iolite gneiss with gem-quality iolite nodules near ruby, sapphire & kyanite vermiculite schist at Palmer Canyon in the Laramie Range, Wyoming. This was followed by another discovery at Grizzly Creek in 2004 which included the largest iolite gems ever found on Earth. In the following year (2005) flawless iolites were found in the Sherman Mountains north of Laramie in what likely is the largest gemstone deposit on the planet but remains unexplored. Beautiful gem-quality iolite in outcrop at Grizzly Creek. Iolite (gem-quality cordierite) can produce beautiful gemstones with an appearance of sapphire - but with the addition of extraordinary pleochroism (this means simply that it tends to change color as the gem is rotated in light)! In 1996, the first, known gem-quality iolite deposit was discovered at Palmer Canyon in the central Laramie Mountains of Wyoming (Hausel, 1998). At the time, iolite was one of the rarest gemstones on earth. Following discovery, thousands of carats of iolite were recovered with minor pink sapphire, some ruby and considerable gem-quality kyanite. The largest known iolite gemstone in the world in 1996 was also found by the author and named the 'Palmer Canyon Blue Star' - a rough gem of 1,750 carats. Several stones of more than 100 carats were also recovered at the time. Following discovery, geological models were developed by the author to assist in a search for similar gemstone deposits (Hausel, 2002, 2007; Hausel and Sutherland, 2000, 2006). In particular, these types of deposits (iolite and kyanite) were typically found in alumina-rich metamorphic rocks of moderate amphibolite grade. 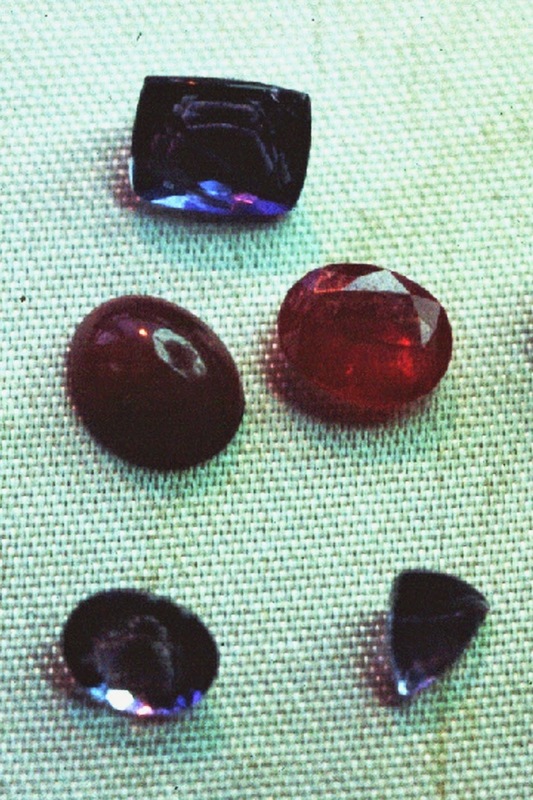 Whereas the nearby rubies and sapphires were located in a silica-poor vermiculite schist (known as glimmerite). Using geological models, it was predicted in 2000 that Grizzly Creek south of Palmer Canyon would likely be a similar deposit as Palmer Canyon (Hausel and Sutherland, 2000). Thus in 2004, we verified my geological model and proved that Palmer Canyon contained a similar suite of gemstones including the largest iolite gemstones ever discovered (Hausel, 2004). The largest gemstone I carried out, I named the 'Grizzly Creek Blue Giant' which weighed more than 24,000 carats! But this detrital stone was dwarfed by the giant stones we left in the outcrop since we lacked the proper tools to carve them out of the hard rock. Selection of faceted iolite and ruby gemstones from Palmer Canyon. The Grizzly Creek Blue Giant gemstone was donated to the Wyoming Geological Survey and was put on display on the first floor of the agency at the University of Wyoming campus. If one were to assume iolite gemstones would sell for $20 to $50/carat, this one stone alone could produce $500,000 to $1.2 million in faceted gems. With some gemstones remaining in the outcrop that likely weigh hundreds of thousands of carats, the value of this gemstone deposit could be considerable. But the discovery was followed by discovery of another giant gemstone iolite deposit by myself known as the Ragged top-Sherman Mountain deposit further to the south in 2005 (Hausel, 2005) and this was again followed by another deposit in Helleck Canyon a short time later (Hausel, 2007). Hausel, W.D., 1998, Field Reconnaissance of the Palmer Canyon corundum-kyanite-cordierite deposit, Laramie Mountains Wyoming: Wyoming State Geological Survey (WSGS) Mineral Report MR98-1, 7 p.
Hausel, W.D. 2002, Gemstones, Semi-Precious Stones, Lapidary Materials, Ornamental Stones and Other Unique Minerals and Rocks in Wyoming, Rocky Mountain Section, Geological Society of America 54th Annual Meeting, abstract no. 33540, p. A54. Hausel, W.D., 2004, Geological Reconnaissance of the Grizzly Creek Gemstone deposit – Potential Source for Iolite, Sapphire, Ruby & Kyanite WSGS Open File Report 04-14, 8 p.
Hausel, W.D., 2005, Geologists Locate Giant Gemstones: Prospecting and Mining Journal, v. 74, no. 7, p. 7-9. Hausel, W.D., 2007, Gemstones of Wyoming - Recent discoveries: Colorado Geological Survey Industrial Minerals Forum, 12 p.
Hausel, W.D., and Sutherland, W.M., 2000, Gemstones & Other Unique Minerals & Rocks of Wyoming - A Field Guide for Collectors: Wyoming Geological Survey Bulletin 71, 268 p.
Hausel, W.D., and Sutherland, W.M., 2006, World Gemstones: Geology, Mineralogy, Gemology & Exploration: WSGS Mineral Report MR06-1, 363 p.
Dan, You are amazing, and so are your discoveries! Nice post.The Gjspc Laboratory for Rudraksha identification and all type of gemstone identification .Every report includes Unique Report Number, approximate Picture, and measurement, along with its identification characteristics. Gemstones are really nature's wonder and they have a very positive effect both on health and life as well provided that the right gemstone for a person should be exactly identified based on his birth time, astrology & horoscope etc. Nice Blog Thanks for sharing, Buy natural gemstones visit below links. Nice blog, we are the best astrologer in bangalore, we provide the free astrology services through online, for more details click the below links to see free astrology. Nice Blog, Thanks for sharing. Buy Original gemstones at Best prices visit below links. Well written post, I really love to read this. It provides great information to the user. I'm also writing on various blogs on Astrological Gemstone and Mangal Dosha. They provide you effective astrological remedies to remove any kind of problem form your life. You can read on mPanchang to get deep information in detail. Our gemstone Identification report professionally documents the results of a full examination of a material. The results detailed will identify the material examined giving such identifying characteristics as colour, clarity/transparency, shape, cut, dimensions, weight and a coloured photo. This is my honest review about Dhan shree gems. They were the best of their services. I purchased a Gemstones. They gave me a 100% guarantee of both the stones that both stones are natural, genuine energetic and pure. Yellow Sapphire is also known as Pukhraj. It is an attractive stone of a beautiful yellow color. Its quality depends on its color, cut and transparency. It is a precious gemstone related to the family of corundum. Emerald is also known as Panna. It is an attractive stone of green color. It is a precious gemstone related to the family of beryl. The most precious emeralds are bluish-green to green and have a medium-dark tone. It has 20 years of trust and experience in this field by providing exclusive gemstones at a reasonable price. Get Gemstone online service. 100% guarantee of quality and naturalness of gemstones along with its certification report. Blue Sapphire is also known as Neelam. It is a naturally occurring gemstone usually found in igneous rocks and in alluvial deposits. Its quality can be determined by its cuts and transparency. It is an attractive stone of a beautiful yellow color. Its quality depends on its color, cut and transparency. Buy gemstones in Delhi. It is a precious gemstone related to the family of corundum. The most precious emeralds are bluish-green to green and have a medium-dark tone. buy online gemstones at a reasonable price. It has 20 years of trust and experience in this field by providing exclusive gemstones at a reasonable price. Get Dhanshree Gems online service. 100% guarantee of quality and naturalness of gemstones along with its certification report. The Blue Sapphire is Saturn’s precious gem should worn on saturday. This most talked about gem gives the quality of influence and status in society. If people facing any problem in marriage or delay in marriage then you should wear Pukhraj stone or Yellow Sapphire Gemstone. This stone removes all the obstacles from your marriage path. Yellow Sapphire can also boost your marital life. Anyway Gem Hunter its been awesome reviewing your generous details on those adventures you wished to enjoy and acxomplish satisfaction with. I wish I could make my way up there but currently I cant and am stuck in Las Vegas for now. The Gemhunter, a polymath of rocks, martial arts, stars, pencil, written word & public speaking. A Hall of Fame Martial Artist, Geologist, Author and Public Speaker. Look for numerous blogs by the GemHunter on gemstones, gold and martial arts designed to help the reader learn about these subjects.